The Lindsey Racing 3X+ Oil Cooler Kit for the 944 Turbo was purpose designed and built for the 944 Turbo. It is the biggest and baddest 100% complete production oil cooler kit for the 944 Turbo available. With a 8 Row 24" wide, 2-1/4" thick, and 4-3/16" tall core, your engine oil temperatures are well protected. 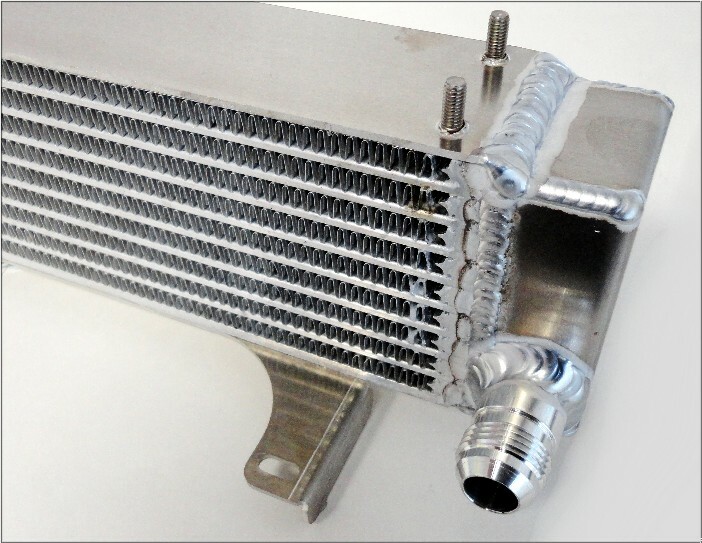 At OVER 3 times (X+) the size of the factory oil cooler, it will provide adequate cooling of the engine oil no matter what the car is used for or how much HP you're making. 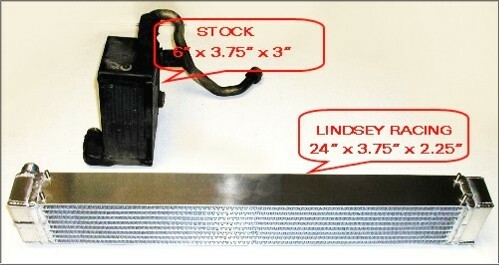 The core on the Lindsey Racing Oil Cooler is 226 cubic inches, where the stock oil cooler is 67.5 cubic inches. The kit will have you removing your factory oil cooler and lines. This kit doesn't work in series with the stock oil cooler like the KISS oil cooler kit we offer. So if you have a leaky factory oil cooler, and/or lines needing replacing due to age or damage, this upgrade makes even more sense. 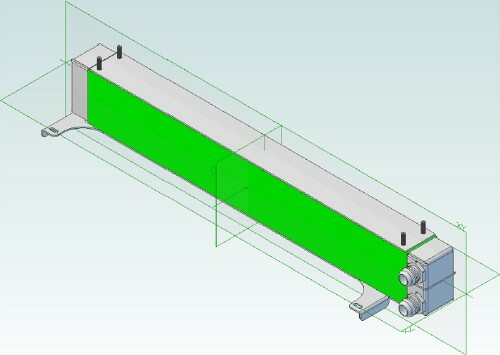 The factory oil cooler with lines and fittings weighs 7.2 pounds. The 3X+ capacity Lindsey Racing oil cooler kit is 8.6 pounds. A small weight gain for large gains in cooling capacity. A completely stock HP 944 Turbo will require an oil cooler when used on a road racing circuit. If you don't have one, you can easily exceed the safe operating temperature range of some oils and they break down very quickly. Excessive oil temperatures can also cause the engine coolant temperatures to rise. Keep you oil temps in check, and it's much easier to keep your water temperatures in check as well. For comparison purposes, we chart below the cubic inches of the oil cooler cores area on the stock 951 oil cooler, the KISS oil cooler (which uses the stock cooler as well as their cooler) and the Lindsey Racing 3X+ Oil Cooler cores. This 100% complete packaged oil cooler kit will gives you the comfort of knowing you have done all that you can do. You will be supplied two new 22mm to -12 JIC fittings that get installed into your oil filter console. The massive cooler then mounts to the chassis and connects to the oil filter console using -12 SS Braided Hoses. Although we built this because we work so extensively with the 944 Turbo, it's not limited to the 944 Turbo. This can also mount to other 944 based chassis. For example you can mount the 944 Turbo's oil filter console on a standard 944 NA engine and use this kit as is. 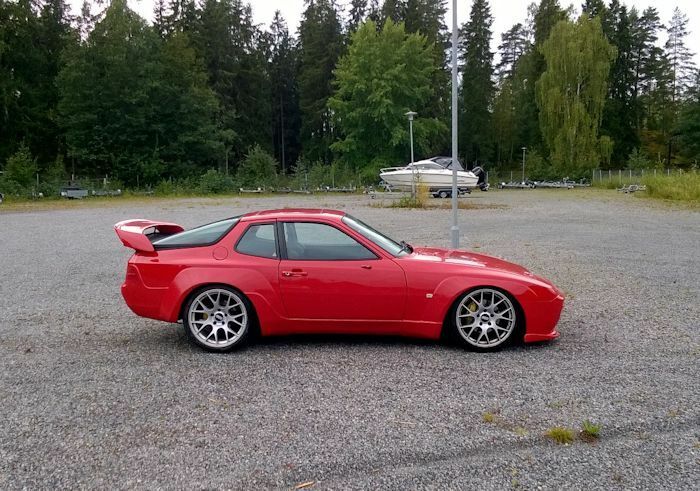 Same with a 944 S2. 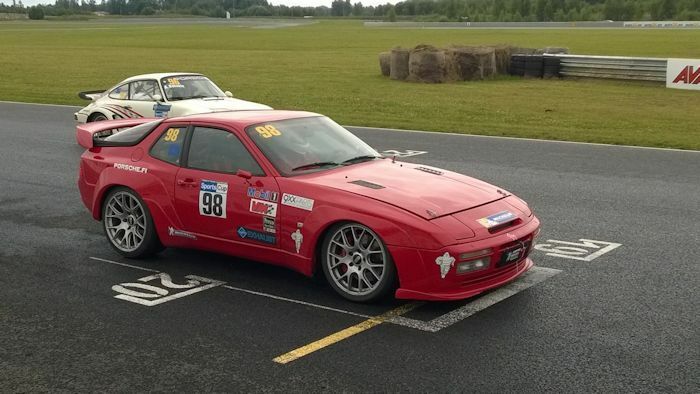 Consult Lindsey Racing for what you will need to do a adaptation like this on another chassis such as the 968. The cooler itself has 4 6mm studs on the top plate and mounting tabs on the bottom which can be modified making this cooler ideal to be offered as a "Cooler Only" for those wanting a cooler of this size and capacity for other projects like 911's or non-Porsche applications. Perhaps you want to use this with our Dry-Sump kit. 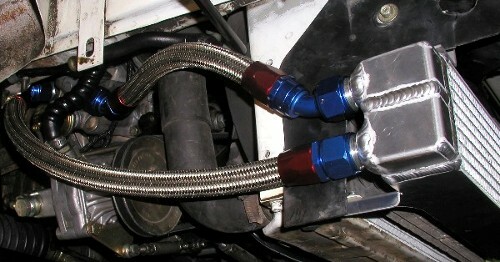 Then purchase the Oil Cooler "only" without the lines and fittings.